There are quite a few 5 in 1 steam mop out there. The most common thing in almost all the best 5 in one steam mops is that they have a detachable handheld steamer which as you might already know is a handy tool that will turn your cleaning chores into a delight. The h20x5 steam cleaner (white) comes with a stamp of approval from the reputable consumer research institute, Good Housekeeping. This h20 steam cleaner is a standing cleaner that converts with ease, at the touch of a button, into a versatile handheld cleaner. This h20 x5 steamer can refresh garments and fabrics. It can also deodorise and sanitise your surfaces leaving them looking like new. It kills 99.9% of all germs and bacteria on your floor surfaces. It is absolutely brilliant. Happy customers commented. The Beldray 5 in 1 Steam Mop is a total multi-purpose steam mop that has proved to be quite reliable. It has variable steam control and can clean windows, carpets, upholstery, steam garments and all types of sealed hard floors including laminate flooring. This is a reliable steam mop you get to enhance your cleaning experience. Wolf 1200W 5 in 1 is yet one more five in 1 steamer that offers lots of promise. The Wolf 1200W 5 in 1 Super Heated Steam Cleaner is a standing upright cleaner that has an attached handheld cleaner. It comes with a fully kitted handheld accessory kit that can turn the Wolf 1200W 5 in 1 into an ultimate cleaning machine. As the name suggests, the Wolf 1200W is powered by a 1200 watt motor that heats the 500ml water tank in 30 seconds to produce steam that can enable you to clean for between 15-30 minutes depending on steam variation you have set. It has variable steam control to regulate the amount of heat released to your different floor types. It has a five meter power cable. It uses ordinary water and can clean worktops, sinks, taps, grouting, hobs and ovens. The accessories include a window squeegee that allows you to clean windows and mirrors. It can refresh upholstery and mattresses. The Wolf 1200W 5 in 1 Super Heated Steam Cleaner is probably one of the few steam mops that has an inbuilt pump system that is able to power jetting steam (3 bar) of upwards of 150 degree centigrade for efficient cleaning. It has warning light to indicate the power is on and a detachable transparent water container. Some of the key accessories include a detachable nozzle, a bristle brush an angled removable nozzle and angled wire brush. The Super Heated Steam Cleaner is fairly priced just shy of thirty quid at time of writing. It has a 3.8 star rating from the possible 5 star from 368 customer reviews. At that price point and the promise it offers, you might want to try it from Amazon. 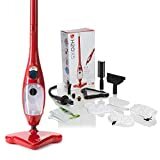 At least Amazon offer a standard 12 month warrantee, which might be just about enough time to test drive this 5 in 1 cleaner. One more 5 in one steam cleaner is the Gold-Tec F5 5 IN 1 Green Eco friendly . The GOLD-TEC® F5 5 in 1 Green Eco Friendly Steam Mop is a standing mop with an attached handheld cleaner. It can clean most sealed hard floors including stone, lino and parquet. It can also clean/refresh carpets, grouting, crevices on kitchen taps, curtains and upholstery. The GOLD-TEC® F5 5 in 1 Green Eco Friendly weighs only 3 Kgs and has a handheld cleaner. It also comes with a number of accessories like window squeegee for window cleaning and a carpet glider for refreshing carpets. It has 4 variable steam settings for the different floor types. The brushes and nozzles that are in the accessories kits lift off seated dirt to leave your surfaces looking really newish. This is a truly multi-purpose 5 in 1 steam cleaner that is fairly priced (under 30 quid). It offers good promise of being a reliable but the reviews are somehow split. It has a 3.4 star rating which is borderline for me. The key complain seems to be that they tend to break after close to a years time. Their customer service has been brought under scrutiny but the jury is still out because only a sample few people have written unflattering reviews about them. It only has 12 reviews so far at Amazon UK which is not enough to make a comprehensive overview. So which one is your favorite Best 5 in 1 Steam Mop?